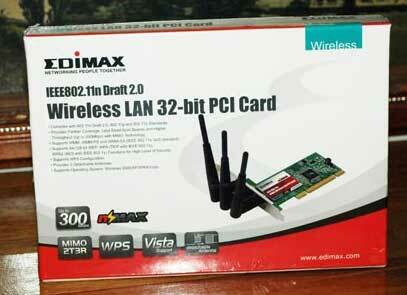 This page has reader reports on the Edimax 802.11n PCI card (RAlink chip based, using their OS X drivers). 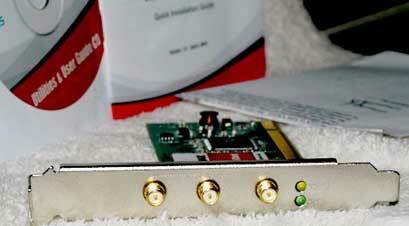 "Have replaced the Edimax 802.11n products with our NewerTech line of wireless products. Our NewerTech line comes with the Mac driver + a real Mac manual right in the box and full Mac support from NewerTech of course. Also on the list is our 802.11n/g/b performance router. And it's one of the most cost competitive 802.11n routers on the market. (If you've used the Edimax 802.11N PCI card, PCMCIA card or USB adapter with Macs, let me know the details (including base used, mode, any range/performance tests, etc. - send to news at this site.) Thanks. 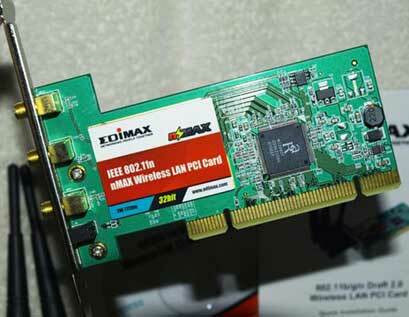 "Thought I would share my experiences about the Edimax PCI N Card. I just got a Airport Extreme N Base Station this weekend and tried out a RA Link PCI N Card I got off eBay. EW-7728In. I'm using it on a PowerMac G5 running 10.4.11. I'm using the latest drivers from RALink. If the machine goes to sleep, it may take 90 seconds for it to reconnect, or one has to launch the utility and then reconnect. Definitely annoying and not great for regular users. Haven't tried any kind of fancy uploads yet...but I hope Apple will write a native driver that will allow the card to work as an "Airport Card". I'd not hold my breath though, as support for other than their OEM shipped cards historically hasn't been a priority (although luckily some same-chipset cards have worked natively in the past) - Apple's 802.11n cards (mini-PCIe format) use either the BroadCom (i.e. Mac Pro card) or Atheros AR5008 (i.e. MacBook/Pro cards) as mentioned last year on the previous page on Mac 802.11n info/adapters/routers. "I just installed this in my computer today. 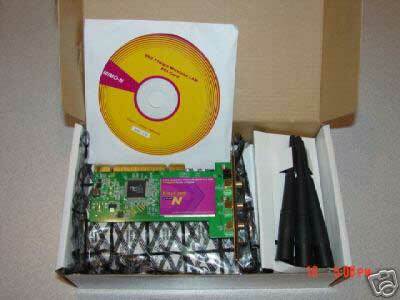 (Edimax 802.11n PCI card.) It was so easy. I remember trying third party cards and ones that claimed to be mac compatible, but just ended up being giant paper weights. It's so nice to to just pop in a card, install a driver and just use it! Connection was fast! Could not tell the difference between my Ethernet connection and the new wireless card. I noticed the biggest improvement was with the uploading to my remote hard drive on my airport extreme. I was pushing 2 MB per second! I am happy with that. It's a great deal, and its nice to finally have a product that does what it says it will do! The one thing that is kinda annoying is you have to set the utility it comes with to be one of your launching items at startup. If not you have to manually open it and connect to your network. Oh well. But I love it! Attached are photos! FYI - here's a Edimax 802.11n PCMCIA card user's RAlink Utility screenshot with it active, showing the cardbus version also has MiMo.
" I just got the Edimax 802.11n card today from OWC and installed them in two of my computers. One computer is a Quicksilver and the other a G5 dual 2.0 Ghz. The installation was easy and the drivers discovered the cards right away. I seem to be connected at a faster rate than before, but I have not tried to discover exactly how fast, yet. I tried to set up my airport extreme (802.11n) base station to the N standard at 5 Ghz. My macbook core 2 duo (already n compliant) had no problem at all. the Edimax cards could not find the network when I did that. (I added a note to the first reader report on this (UK reader with PCMCIA/Cardbus version) that all the PCI/PCCard/USB 802.11n adapters I've seen so far use 2.4GHz band, not the 5GHz band.) Once a reverted to a 2.4 Ghz N network, the Edimax found the network right away. I tried to transfer a large document between my macbook and my G5, however, the transfer rate was extremely slow. Still trying to figure out the driver software and adjust the antennas, etc. Seems to work, but I am not sure yet if this is the best solution. At first the transfer rate was quite slow, but I repositioned the base station to get better reception from each computer. After that, the transfer was very fast (e.g. transfered a 500 mb file in about 2 minutes). I have noticed that with these cards, I have to log onto the network a lot. 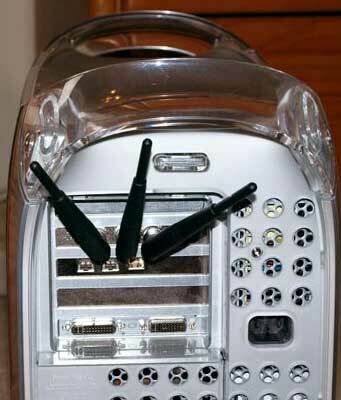 If the computer is asleep for a while, I usually have to open the wireless software and re-connect (which also involves re-entering the network password). I hope Ralink will update their software so that the connection stays on and re-connects automatically upon restart or sleep. It is fast, but not as convenient as airport. Good Point. I just left the utility program running and there were no problems. I'll make it a start-up item, which should solve all my problems. Otherwise, the card is working great and download/transfer rates have been much faster than my 802.11g airport card.